Firstly, I'd just like to say hello as this is my first time posting on the board. I've decided to explore airsoft gaming with a friend of mine and I'm excited to get started. From what I've read on these forums (which is pretty much every post), it seems "newbie" questions are looked down upon along with "which x or y is better" posts so I will try to refrain from doing such. Lastly, I have used the search function and am familiar with it's workings, so if for some reason I unintentionally ask something that one of you was able to turn up through a search, please know that I will have already tried to search for it before asking in the first place so if you could point me in the right direction because of my lacking search-fu, it would be appreciated. All of that being said, I'm obviously a beginner and eager to learn more. I've been reading pretty much anything I can find on the sport in an effort to become acquainted. I've decided on what gun to purchase as my first weapon. I'll be going with the JG G36c with a Guarder Action Red Dot scope, and a laser/flashlight module on the lower rail system. I like the look and feel of the gun, and from every review I've watched and read, it seems to be a fairly competitive entry level gun. 1.) Do people typically tend to pick their tactical gear to match with their BDU's camo-wise, or is it usually opted to pick a contrasting colour like OD tactical vest over woodland camo? I've seen photos lending either way, so I'm led to believe it is a personal preference like pretty much everything here, but I'd prefer to not look like a complete novice my first day ever playing if I can avoid it. 2.) The vest I am looking at has the pouch for carrying a hydration system. As I have no experience with this, and my searches turned up nothing besides "bring water", I was curious as to if they hold enough water for an average length game, or will I be needing to refill it halfway through the day? Secondly, how durable are the bladders? IE - if I rolled onto my back or fell over, I'm not going to end up looking like my back pissed on itself? 3.) As I'm having a difficult time trying to decide between the two camo's, what do you experienced players see more of on the field? What is the general consensus on the two among the airsoft community? 4.) Lastly, as I said previously, I have a good idea on what I want, but if you see any glaring omissions or something you feel would be a better choice, I'd be happy to hear your opinion. Any help you guys could offer would be much appreciated. Well, I've blathered on enough. Thank you for taking the time to read all this, and more importantly giving your input! 2.) I can't imagine you would ever need to refill a camelbak in one day's play. They are pretty large and hold more than you think. As for durability, I have never had a problem with any. 3.) Woodland is definitely your most common camo type. You see multicam and digital patterns more and more though. If you are on a budget, there is nothing cheaper or more readily available than woodland. 4.) Welcome to AO. As you guessed, you pretty much have to walk on eggshells around here. Good first post though...better than most I've seen. First off, welcome to the game! I think you will like it a lot. 1. this is my experience, but usually do NOT mix tan and woodland, as that causes someconfusion on the field. wear either matching colors, or a neutral colored vest, like black. 2. the bladders are pretty strong, but usually in the game, you want to avoid either falling or being on your back, unless necessary. they hold pretty well, but if you get a stick or thorn, then you better have a back up ready. and bring enough water to refill at least three times. 3. I have both woodland and tan. i prefer woodland for most events, because it blends into wood and tall grass well. good luck, dont get a big head, and keep quiet, and you will do great. I do not ask you to beg for mercy. I ask you to do as I say, and your pathetic plea for forgiveness was not what I said to do. For disobeying me, I have to chastise you harshly, and will do so without remorse, enjoying listening to you scream in terror and pain. This is the biggest load of bullocks I have heard in a while. 1. 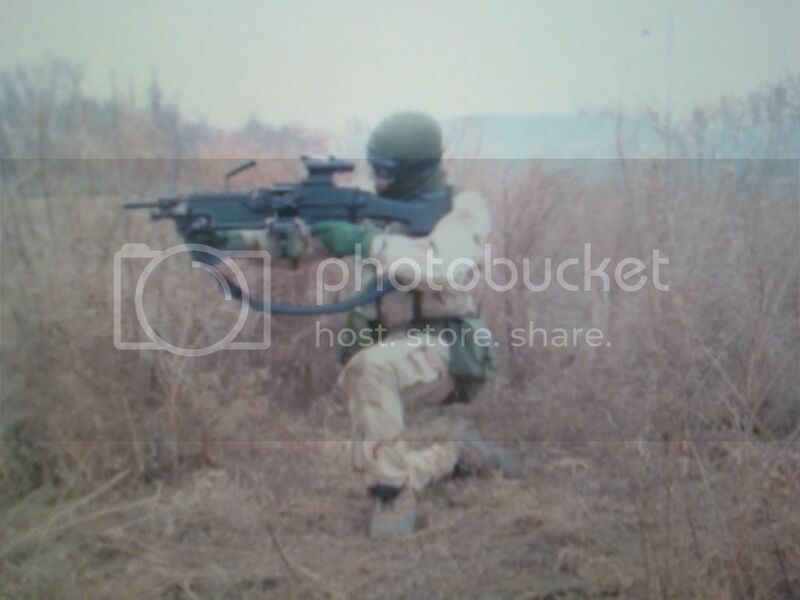 Mixing a Tan BDU with Green gear, or visa versa, looks fine. In some cases, it looks great. Ask Son of Liberty to see some pick of the last VC game. Gear doesnt cause confusion, lack of proper communication causes confusion. Which is exactly what is going to occur here. 2. In the 5 years I have played this game, I have never had a bladder burst on me, not once. And trust me, I have fallen plenty of times, and on a variety of things. On a hot day, I can refill a bladder 2-3 times, at 2.5liter incriments. Its all personal preferences and habits however. 3. Does that website sell anything other than junk, or overpriced guns that you could all buy locally for 25-30 bucks less? 4. All of the original questions have been answered already with just more searching. Its not hard to do. I shouldnt even have replied to this, but the load that was dropped by someone who suggested making your own flashbangs from a half-cooked idea just got me going. Dont give advice is you havent a clue in which you are talking about. Last edited by Spectre; 03-24-2009 at 04:57 PM. 1. Mixing a Tan BDU with Green gear, or visa versa, looks fine. In some cases, it looks great. 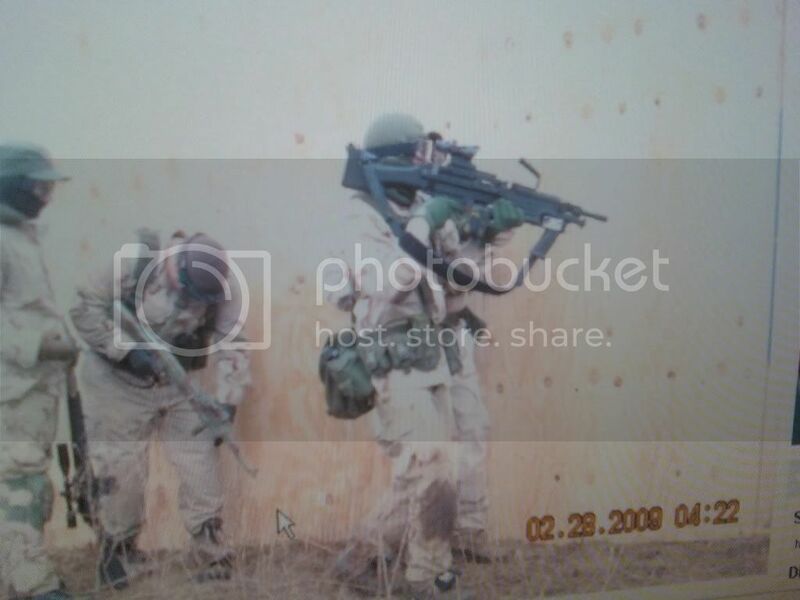 Agreed, these are some pictures of me and some others opp:122 i believe back in feburary using DCU and OD green gear. It looks great if you ask me. Yea, I personally think that DCU and OD look great together as well. What you wouldnt want to mix though is like a tiger stripe and woodland. Too much going on there. But any pattern coupled with a different solid color should work and look just fine. if you notice, spectre, i said those as my own opinion. for my team, we do not mix our colors, because it causes confusion on our team, and we mostly end up shooting each other in the back, thinking that some either tan or woodland is sneaking in on us. if you choose to mix, thats cool, but he asked for input and that is mine. second, i sayed that if you hit a thorn or stick, it may very well pop, because i had that wonderful experience at op 114. and i asked if anyone knew anything about the flashbang idea, because i thought that that would be a rather interesting aspect of the game. thank you for showing that you think it is a stupid idea, and for sharing your opinion as a son of liberty. i really appreciate your opinion of my experiences. have a great day! first those pix are cool, but i ment more of wearing the tan vast with a woodland pattern, just because it takes a double take if you see a tan body with green sleeves. Before you go "rendering opinions", you should read the forum rules about double posting, and capitalize for the love of the English language. And yes, have a nice day. You know, I think we got off to a bad start. I think that you are a pretty good guy. Sorry for anything that offended you, Spectre. Are we good? And did you happen to be at Op114? I thoroughly disagree that a woodland based pattern with tan gear is "confusing" to say the least. It's no more confusing than OD gear on a desert pattern, which happens to be not at all. I personally use MARPAT with a tan based rig and it works just fine. Mixing and matching helps when it comes to breaking up the outline of your body and blending with different enviornments. As for camoflauge, Maverick stated it perfectly. It's almost all a matter of preferance. Thanks for doing research before posting too and being objective in your questions. It leaves a good first impression. It seems AO is becoming plagued more and more with "Waht gon is tha bestest?" threads. Your grammatically correct post brought a tear to my eye. 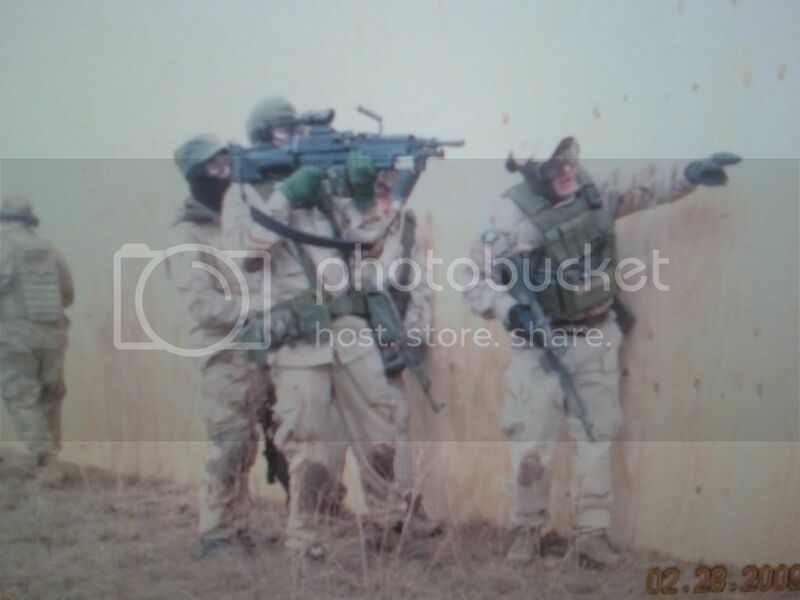 I agree.. ASL generally wears "TRU" spec woodland... and several of us have Tan chest rigs..
now.. what I personally find confusing.. is the 'green multicam' (usually the china knockoff) while highly effective, it makes it much harder to determine team, from a distance.. , in fact, at open 006, we almost medic'd a tan team... and actually 'lost' 2 players trying to get to him. I have had both and recomend the second pack because of the added pouches. It will fit onto the molle straps on the back. Its a few more bucks, but will keep you from fixing JGs out of the box. I would take the money from that and put it into getting the Echo1 G36c. If you have not seen the ohio retailers where you can walk in they are in quick links. You can get almost anything you could from an online website, and it helps keep airsoft local. We have a pretty good area for airsoft, and by supporting local stores you can keep it up. Welcome to AO, and hope to see you out at the fields sometime. Evening guys! Firstly, thank you for the warm welcome and all the great advice! I appreciate your input, especially Cut Throat's. You've given much to think about. I'd like to note that I personally don't know much when it comes to "proper tactics" or what makes for a realistic outfit for my gun, but I do appreciate what you were saying about the laser/flashlight. I think the main reason why I wanted to go with them is because the gun felt a bit naked without it, and on top of at least giving me the option in CQB, I couldn't think of anything else to use the rails for besides a foregrip which I don't like the look of. If you guys have another suggestion I'm definitely all ear... erm, eyes. I do agree that the Echo1 seems to be a more intelligent purchase, and I appreciate you showing me that there is a local retailer here in Columbus. I'm excited to stop by there this week and check it out! I wasn't sure whether it would be proper etiquette to provide links in my post, as I didn't wish to inundate anyone as it was already lengthy, but I will post just a couple to give you some information and see what your opinions are in the matter. - Tactical Vest: Now what I can't tell is if the back of it is actually MOLLE compatible or if it is simply a lookalike. If a separate hydration pack would be better as was stated, then I'd like to make sure that a MOLLE one will work. Secondly, I'd wither be picking this in matching camo, or OD. Again, haven't decided. - Left Handed Drop-Leg Holster for my CO2 Taurus P24/7 (I'd be placing a CYMA M18C Electric Pistol as my second sidearm into the holster on my vest. As stated before, any and all suggestions are welcome. Thank you again for taking the time to offer your assistance. I'm more and more excited each time I look over all of this. Can't wait to get started! Last edited by snapshot_superhero; 03-25-2009 at 10:01 AM. To be honest, its all trial and error. There is no such thing as "bad gear" Its all opinion. Except for LPEGS!!! Your eyes: I noticed that you're looking at staying below 20. Please dont. Your eyes should be your highest priority and should be item number one. You can play without a gun but you cant play without your eyes. I'm not saying you should be like some and spend over 100 bucks, however there are pleanty of good eye protection googles near the $40 range. Your feet: Everyone has a brand preference, but from my experience, you cant go wrong with something thats military issue. I've had alot of boots over the years and only one pair has not been a military issue boot. Its the only pair i dont wear that often . Also, when you do decide on a pair of boots, wear them around for a couple hours a day for about a week prior to attending an event with them. A pair of brand new boots will not feel too good after a day (or mid day) of airsofting. Water: Its a must, dont skimp. I see alot of players with canteens and i think they're ill-equipped. I like the blackhawk hydration carriers/bladders. Ive had other brands and have been left dissapointed. I recently switched to the Blackhawk and the difference is substantial. It can be seen in the bite valve, the quick disconnects, bladder, and the way the bladder is held inside the carrier. On a hot day i've gone through a good 2 bladders full of water; some people i know go though 3 or more. Always make sure you bring a couple gallons of water to anticipate refilling. Other than that, like i said, trial and error. My first vest was a UTG cross draw. It did fine. Its still fine and has left my hands and been passed down to my brother. 4 years of abuse and still kicking. One thing i will recommend is to pick a plain vest color. Selecting an ACU or Multicam vest will limit your choices of changing BDU patterns down the road. While multicam works fine with DCU or other tan patterns, it does look out of place. BDUs, its up to you on preference of pattern. I recommend woodland or a Desert pattern. Most larger events(if its your ultimate goal) will be strict on patterns so its always best for your first set to anticipate those requirements. Brand wise, its all about what your looking for. I've had surplus, tru spec, and crye precision. I like tru spec because of the features and the price. Gloves, i hate them. I dont wear them even in the winter. If it were my list (which it is not) they wouldnt be there. I've never had good luck with drop legs either. They always ride up and leave me feeling restricted. To be honest, i rarely ever find myself saying "Damn i wish i had my pistol". My fps is low enough to have a small MED, a single point sling allows me to have a good range of motion with my rifle and has served me well when clearing tight places. Because i do have a few pistols collecting dust, i do plan on trying out the Serpas as those i know who have them give great reviews. You mentioned a naked gun. i've never put anything on my rifles other than a grip. I still use the stock sights and i do just fine. I like the operation of the EOTechs, but there are other areas of gear that i'd rather focus on. The only exception to adding items to my rifle was a surefire flashlight and 1" rail rings to mount it to my rifle for the occasional night game...Which are very few and far between. Most people's wives make them come inside at night and so night games usually keep the veterans away . Because i know what its like to be on a budget, i felt that my experience might be relevant in helping you decide on your gear. Also, i'd like to note that because of how you've presented yourself in your posts is why i've decided to help. I wish other new players could do the same. My suggestions (and they are merely suggestions) to your inquireries are as follows. To the vest, the one you have in the linke uses ALICE on the back, not MOLLE. Also, a cross draw vest might not be that good of an idea for two reasons: 1) unless you NEED a pistol for fps rules in buildings you're taking up space that could be used for holding more mags for your main gun; 2) when dropping to your stomach, the pistol can get in the way since its an odd shape (I can remember well having my pistol digging into my ribs). Those are from my experience. In regards to gear color, if you're going with an OD hat then go OD gear to keep it constant, and it will then be interchangeable with any other BDU you may get besides your green set. I also don't see why you'd need two pistols, that is if I read your post correctly. On a final note about the gear, I disagree with Mavrick and always wear gloves. So that's just a personal preference item. In regards to everything else. Lots of people suggest just showing up to events to learn on the go. That doesn't sound, to me, like your style since you're wanting to put forth this much advanced effort into making sure you don't look like a newbie. Perhaps you should find a few local players, or a team, that would be willing to teach you and drill you on a few things so you can learn the basics of fire and maneuver. And finally, never be afraid to ask questions. 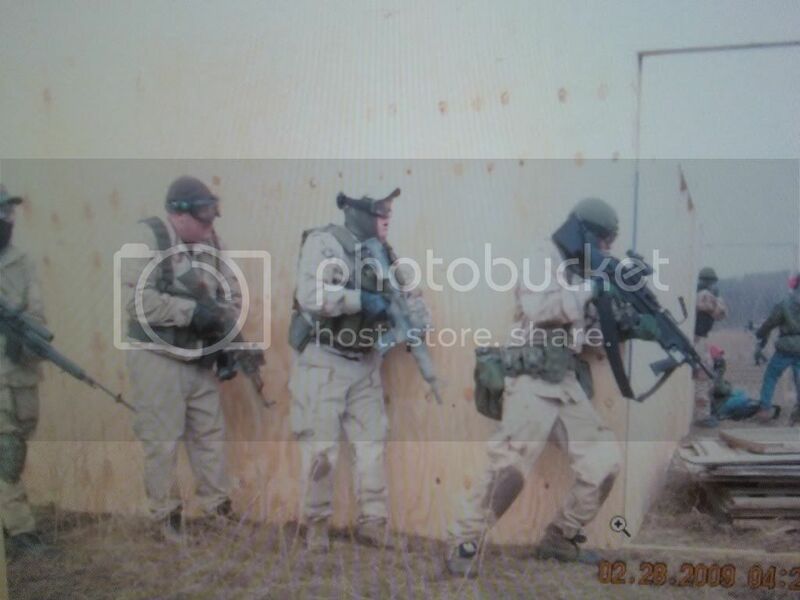 I have ACU BDUs.... other than ACU (which is obvious) what color tach vest/gear looks good/doesn't clash with ACU. OTB. I'd have to say Khaki (Coyote tan) or Coyote Brown (Very different color, search it) would go just fine with ACU. I agree with jimmy. Acu looks good with coyote tan. Khaki is more of a light sand color and coyote brown is a dark chocolate color. But pantac does make acu vests at a good price. But then again why even wear acu? It doesn't really fit in with anything. But that's just preference. Khaki (tan) or foilage green are your best bet. OD and black don't look so good with ACU.